Physical characteristics: Roseate spoonbills are one of the most unusual looking wading birds species. They can easily be identified by the bright pink feathers on their wings and legs and their long, flattened bills. They have bare heads and red eyes. Roseate spoonbills are about 31 inches (80 centimeters) long from bill tip to tail, and they weigh about 3.3 pounds (1.5 kilograms). Geographic range: Roseate spoonbills live in the eastern two-thirds of South America, in Central America, and along both coasts of Mexico. In the United States they breed in Texas, Louisiana, and Florida and they spread out to many places across the country after breeding. Habitat: Roseate spoonbills usually stay near water, and they prefer to nest on islands. They breed along seacoasts, in estuaries where fresh water and salt water mix, and in mangrove swamps. They also breed inland in freshwater swamps, on islands in rivers and lakes, in marshes, and on wet prairies. They feed in shallow water near their nesting places, and also in canals, ponds, ditches, tidal pools, and wherever else they can find shallow water. Diet: Small water creatures, including fish, insects, crayfish, and shrimp are the main foods of roseate spoonbills. They usually walk slowly and the swing their bills as they hunt for food. They also dig in the mud or chase after schools of fish. Behavior and reproduction: Roseate spoonbills usually feed in large groups and roost together at night. At nesting time, they form large colonies and build nests of loosely woven sticks in bushes or trees. 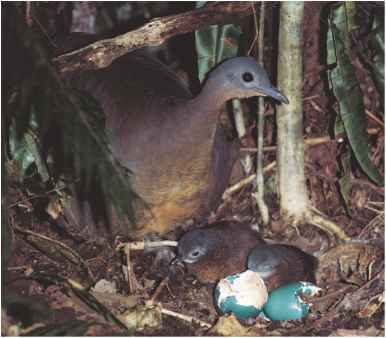 The females lay an average of three eggs, and both parents help raise the chicks. Roseate spoonbills and people: In the 1800s it became popular among some women to use spoonbill wings as fans to cool themselves. Many spoonbills were killed for their feathers. Finally, laws were passed to stop the killing of spoonbills and other wading birds. Arnosky, Jim. Watching Water Birds. Washington, DC: National Geographic, 2002. Bildstein, Keith L. White Ibis, Wetland Wanderer. Washington, DC: Smithsonian Institution Press, 1993. Eckert, Allan W. The Wading Birds of North America. Garden City, NJ: Doubleday & Company, 1981. Hancock, J. A., J. A. Kushlan, and M. P. Kahl. Storks, Ibises and Spoonbills of the World. London: Academic Press, 1992. Niemeyer, Lucian. Long-Legged Wading Birds of the North American Wetlands. Harrisburg, PA: Stackpole Books, 1993. Berger, Cynthia. "You Don't Need a Knife or a Fork when You're a Spoonbill!" Ranger Rick (June 2000): 42-46. "Birds Ask, 'Are We There Yet?'" Current Science (November 21, 2003): 14. Graham, Frank Jr. "Battery Island." Audubon (March 2004): 108. Graham, Frank Jr. "A Wing and a Prayer." (Roseate spoonbills) Audubon (July 2001): 87. Line, Les. "Star Billing." (Roseate spoonbills) National Wildlife (April-May 1999). McNally, Marcia. "Save the Spoonbill." Earth Island Journal (Summer 1998): 7. "Spoonbill Woes." Birder's World (April 2003): 16. Weihs, Daniel and Gadi Katzir. "Bill Sweeping in the Spoonbill." Animal Behaviour (March 1994): 649-654. "Fact Sheets: Roseate Spoonbill." National Zoo. http://nationalzoo.si. 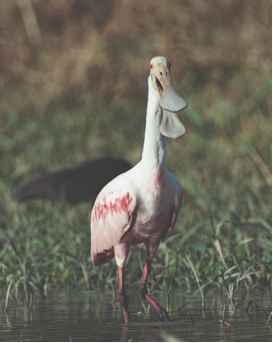 edu/Animals/Birds/Facts/FactSheets/fact-rosespoonbill.cfm (accessed on May 14, 2004). "Sacred Ibis." KenyaBirds.org. http://www.kenyabirds.org.uk/sacred. htm (accessed on May 14, 2004). "Roseate Spoonbill, Ajaia ajaja." U.S. Geological Survey. http://www. mbr-pwrc.usgs.gov/id/framlst/i1830id.html (accessed on May 14, 2004). "Roseate Spoonbill." Everglades National Park, National Park Service. http://www.nps.gov/ever/eco/spoonbil.htm (accessed on May 14, 2004). "Scarlet Ibis." National Zoo. http://nationalzoo.si.edu/Animals/Birds/ Meet_the_zoos_birds/zoo_bird_info.cfm?bird=Scarlet%20ibis (accessed on May 14, 2004). Weinstein, Tasha Marie. "The Roseate Spoonbill; At Home in Florida Bay." Florida Bay Education Project. http://www.floridabay.org/pub/ newspaper/spoonbill.shtml (accessed on May 14, 2004). "White Ibis, Eudocimus albus." U.S. Geological Survey. http:// www.mbr-pwrc.usgs.gov/id/framlst/i1840id.html (accessed on May 14, 2004). "The White Ibis." National Audubon Society. http://www.audubon.org/ bird/BoA/F37_G1c.html (accessed on May 14, 2004).